The aim of ISO/TS 16949 is the development of a quality management system that provides for continual improvement, emphasizing defect prevention and the reduction of variation and waste in the supply chain. It is based on ISO 9001. Kusalava is one of the first few companies in India to be certified for ISO/TS 16949 and the first among the cylinder liner manufacturers, in the year 2000. "VIEW CERTIFICATE". The Quality system is designed to ensure that the Quality Policy is understood and implemented at all levels and in all activities concerning customer service and product quality. The quality system lays emphasis in the use of statistical techniques. Regard for environmental protection is one of Kusalva's basic corporate principles. Product quality, economic efficiency and environmental protection, employee health and safety are equal objectives. Environmental awareness anchored permanently in the principles at kusalava. It comprises the involvement and training of our employees, the saving of resources and consistent optimization of our products and production processes by taking account of relevant environmental aspects. Technologies like Reverse Osmosis and Ion Exchange processes are employed for treatment and reuse of process waste water across all plants. About 2 lakh liters of treated effluent is being reused for gardening and other secondary purposes. More than 10,000 trees help maintain ambient air quality, holding soil and ground water and acting as carbon sinks in the premises. As part of its social responsibility, kusalava is actively involved with State and Central Pollution Control Boards. · Develop, introduce and maintain environmental management systems across the company to meet the company standards as well as statutory requirements for environment. Verify compliance with these standards through regular auditing. · Assess environmental impact of all its activities and set annual improvement objectives and targets and review these to ensure that these are being met at the individual unit and corporate levels. · Reduce Waste, conserve Energy and explore opportunities for reuse and recycle. Kusalava supplies high quality goods and services to its customers. In doing so, the Company is committed to exhibit the highest standards of corporate behavior towards its consumers, employees, the societies and the environment in which we operate. 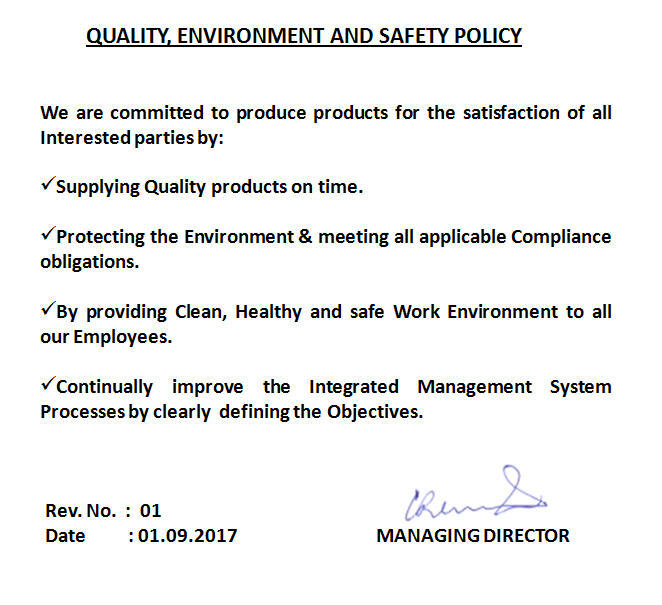 Towards this, the Company recognizes its responsibility to ensure safety and protection of health of its employees in all its operating sites, which include manufacturing, sales and distribution, research laboratories and offices during work and work related travel.